Describe a challenging behavior you are experiencing with your child. Identify your feelings. Remember that a feeling can be described with just one word. (Frustrated doesn’t count because it is a generic feeling that can be narrowed down to a more specific feeling. In the beginning you may need to look at the second column of the Mistaken Goal Chart to find the feelings that fit for you.) Write your feeling or feelings below. Describe what you usually do in response to the challenging behavior? Now get into your child’s world. How would you feel if you were a child and your parent did or said what you did or said? Look at the sixth column of the Mistaken Goal Chart to “break the code” and identify what the child needs. 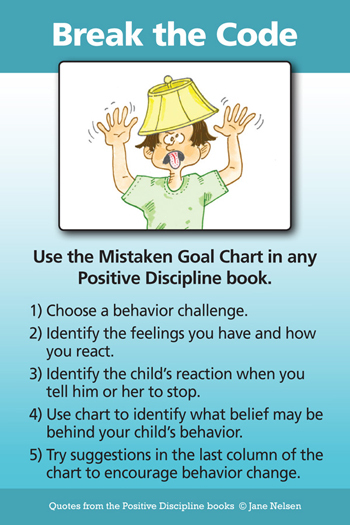 Choose a suggestion from the last column of the Mistaken Goal Chart that you would like to try the next time you encounter the challenging behavior. Describe how you think this might be encouraging to your child and how it might help your child revise his or her belief about how to find belonging and significance. Journal about the results of what you did. If it didn’t seem to work to change the behavior, is it possible that your child is at least making a new decision.